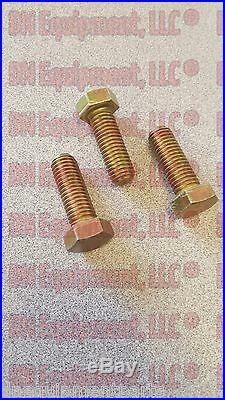 This is for one set of three (3) replacement blade bolts used for Sovema EM-2 Series Finishing Mower. These Blade bolts feature a Left hand Thread! Part Number : 900.102.254. We stock a wide variety of replacement parts for Agricultural Equipment. Please call before you come to verify items are in stock, we try to keep all advertised items in stock at all times. But we would hate to have you visit us and not have the item you are looking for when you get here! We now take Discover Card and American Express Too! Personal check orders held 10 days or until check clears. Your complete satisfaction is important to us. The item "Replacement Sovema Finish Mower Blade Mounting Bolts, Left Hand Thread, Set of 3" is in sale since Wednesday, November 04, 2015. This item is in the category "Business & Industrial\Heavy Equipment Attachments\Mowers & Mower Conditioners". The seller is "dnequipmentparts" and is located in Mount Orab, Ohio. This item can be shipped to United States.